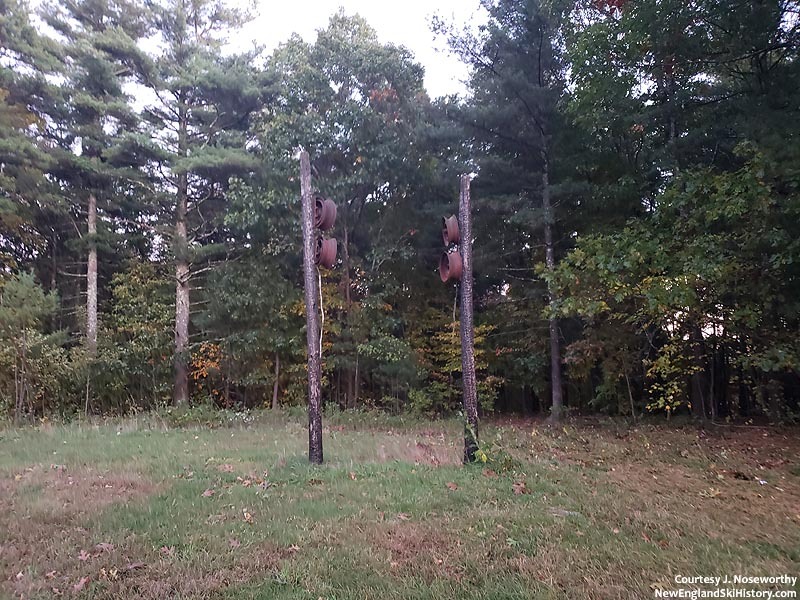 Located northeast of downtown Shirley, Benjamin Hill was home to a small ski area for about a decade. Construction on Benjamin Hill began in July, as a T-Bar and three rope tows were installed. The $100,000 development also included a lodge, snowmaking, and night skiing. The Benjamin Hill Corporation was established in December 1963 with Virginia "Ginger" Heard serving as President. Heard's father, James Scott, conveyed the property and provided financing. Heard's husband Hamilton "Hammy" helped with the operation while not busy running his own firm, while his friend Todd Baldwin served as the area manager. Neither Ginger nor Hammy were skiers at the time. Wachusett's Norm Letarte ran the ski school. The ski area reportedly opened on the afternoon of December 21, 1963, catering mainly to beginners and families. Additional property may have been acquired in the spring of 1964. Facing the rough winter of 1964-65, Benjamin Hill was able to operate thanks to its snowmaking installlation. A new glade area was added, the cafeteria doubled, and a sun deck constructed. The facility also included skating in the winter and swimming and tennis in the summer. At the time, Ginger commented that the "Ski School constitutes one of the area's highest sources of income" and that "Small children have lessons, housewives have morning classes with baby-sitting available, businessmen have evening classes under the lights, and even grandmothers come out to 'brush up' with lessons." Ginger added, "The reward for your work is finding the slopes filled with happy, smiling children, and with families having wonderful days together." Following the 1965-66 season, manager Todd Baldwin left Benjamin Hill to work at Waterville Valley. He and his wife Cynthia later started the Tecumseh Inn. Howard Cadwell took over as General Manager of Benjamin Hill. The 1966-67 season got off to a tough start due to a lack of natural snow across New England. Thanks to its snowmaking system, Benjamin Hill was one of only a couple dozen ski areas to open in time for Christmas that year. 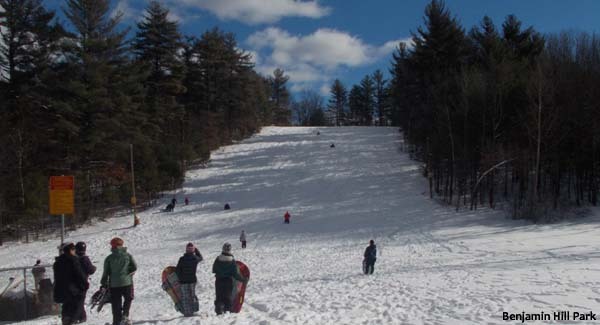 A mid-November snowfall in 1967 allowed Benjamin Hill to become one of the first areas in New England to open. Following that season, Benjamin Hill Corporation spun off five lots of land. Around this time, there were 9 rope tows in operation at ski area, in addition to the T-Bar. For the 1970-71 season, Benjamin Hill reportedly expanded its snowmaking to cover all of its terrain. Changes were signaled in March of 1972, when the property was surveyed. By October, Gerald J Crowley was the President of Benjamin Hill Corporation. Benjamin Hill remained in operation through at least the winter of 1972-73. The 1973 oil crisis may have resulted in the suspension of operations. A May 1975 fire destroyed the Benjamin Hill lodge, resulting in the end of the line for the small ski area. Two years later, the Town of Shirley considered purchasing a plot of land at Benjamin Hill and assuming a $1 per year lease on the ski area. At the time, those involved determined the ski area could have been restored without a major investment. A further blow to Benjamin Hill's future came in 1978, when a volunteer firefighter reportedly burned down vacant buildings at the ski area. On June 1, 1984, J & A Realty Trust acquired a main parcel from the Benjamin Hill Corporation. 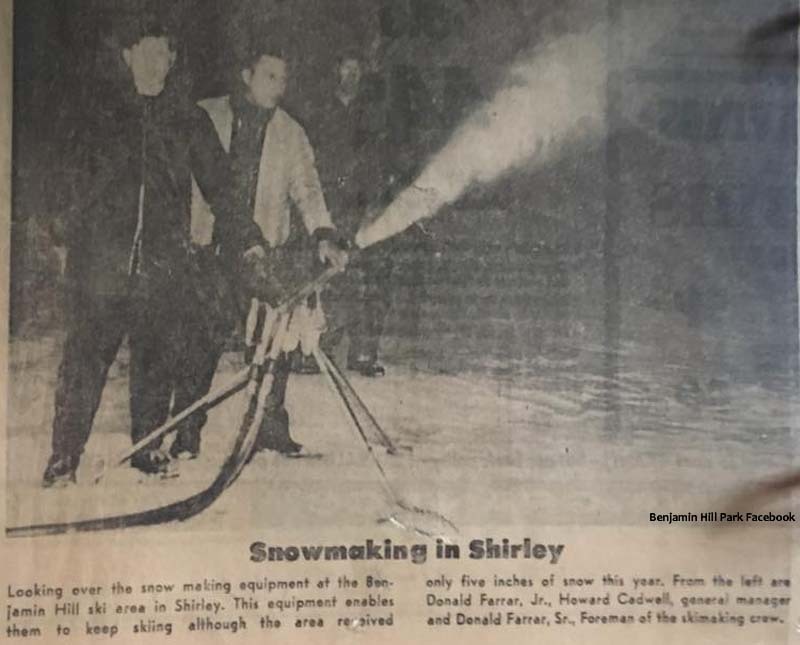 After nearly a quarter of a century, Benjamin Hill saw a resurgence of sorts when the Town of Shirley acquired it in 2000. Becoming a year-round recreational park, facilities were added or improved, including the pool, tennis and basketball courts, and a skating rink. A portion of the old ski area has become a sledding hill.